Nothing challenges humans more than nationalistic pride and its fruit, prejudice and racism. Imperialism, war, and all manner of human destruction inevitably sprout from such soil. This thought came to my mind as I read the latest public ruminations of a certain Israeli acquaintance of mine, a Chicago expatriate — a rabbi, no less — currently residing in a West Bank settlement and author of a column in the Jerusalem Post. Having just returned from Palestine, Rabbi Dovid’s words cut me to the quick. Of course there is a “real” Palestinian people with a national identity, I wrote to my friend in an email! (We Americans tend to consider just about anyone a friend, even those with ideas diametrically different from our own, provided we’ve walked around and had a drink together). Denying Palestinian culture is more than just preposterous, I continued. It’s racist and hateful. I had traveled up and and down Palestine extensively, and had met Palestinians; learned about their culture and heritage. I had seen, heard and experienced it, including the tradition of greeting strangers with cold drinks on a hot day, served up in fluted glasses, on attractive metal trays (an experience I can describe in detail). There are many ways to uphold one’s own culture and heritage without demeaning someone else’s, I added, in a moralizing tone. That’s what peace-building is all about. Rabbi Dovid wasn’t convinced. There are Arabs who live in the Land of Israel, he scoffed. They may have certain family or tribal customs, foods etc. But as there never was a ‘Palestine’ or Palestinian ‘nation’ other than the one Jews have founded, then there is no such thing as Palestinian ‘culture’. A day trip from the Palestinian town of Beit Jala to nearby Battir in the company of a woman named Vivien Sansour shatters Rabbi Dovid’s proposition. Standing on the edge of little Battir, I feasted my eyes on one of the world’s most astonishing sights: an amphitheater of ancient stone terraces covered in a cornucopia of fruits, vegetables, herbs and trees — including olive trees reputed to be over a thousand years old. The engine of all this biodiversity? A very special microclimate, for sure. Also — getting to the nub of the matter — a source of pure spring water that Battir’s eight extended families have been cooperatively managing for generations. 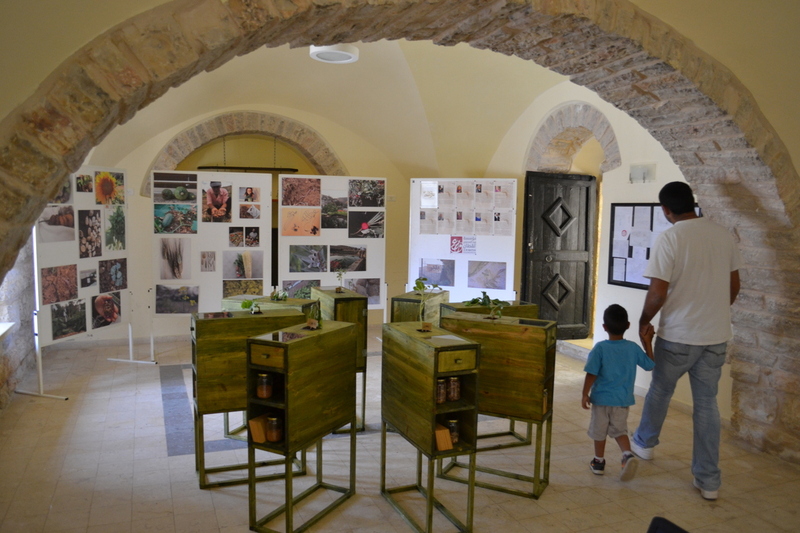 Battir’s diverse, cooperatively managed gardens earned it World Heritage status from UNESCO back in 2014. (the ‘C’ standing for “Culture”). “Endangered” status, no less. For years, Israel has been wanting to run its Separation Wall across Battir valley, a move that would destroy it. 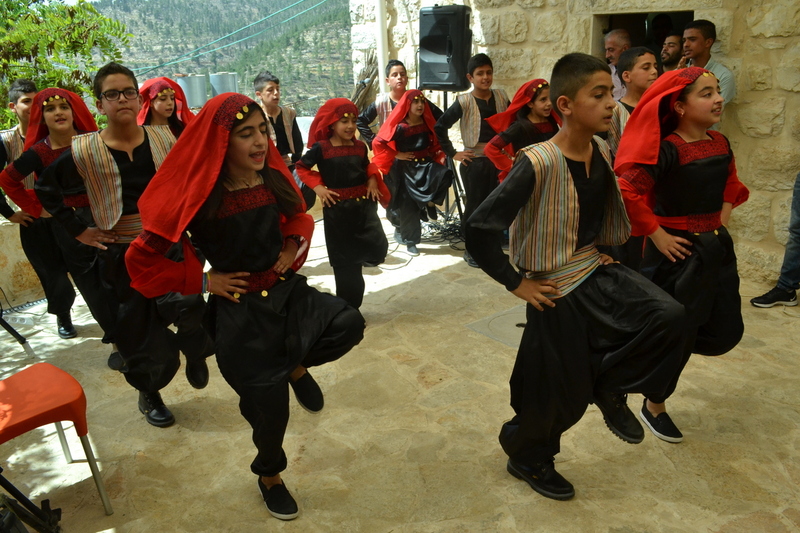 Battir’s UNESCO status has put Israel’s plans on hold — for the time being. Vivien Sansour and I drove to Battir from Bethlehem sister city Beit Jala. It’s just a few miles, but takes time. Israel’s Wall surrounds Beit Jala on three sides, and the road leading to Battir is much more winding than the one Jewish settlers use to move back and forth between their tidy homes and Jerusalem; or from Jerusalem to occupied Hebron. So our trip to Battir took forty-five minutes. A beautiful drive. Before leaving town, Vivien pulled over to the side of the street to pick up some Palestinian heirloom apricots from a street vendor — juicy, misshapen fruits with a back story. They had been grown on a nearby parcel of land squeezed between a handful of Jewish settlements. 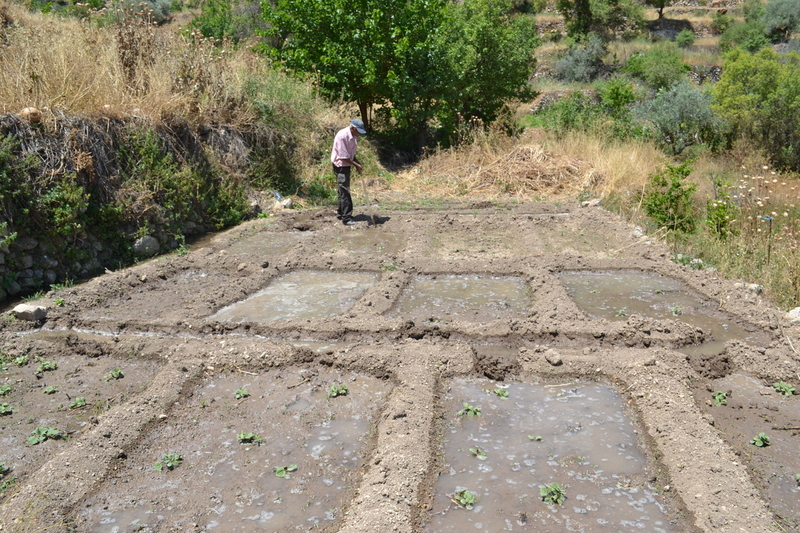 Growing rare varieties of fruit on fragmented land, with restricted water access, is a major challenge. Palestinian apricots are all the more prized. Because the traditional (as opposed to Israeli industrial) apricot season lasts only a couple of weeks, Palestinians have coined a term for the ephemeral; for the kind of phenomenon that can barely be counted on, because it’s so brief: fil mishmish. ‘In the time of the apricot season’. In English we’d say ‘When pigs fly’.